Windows 10 is plug and play: more simple to use. 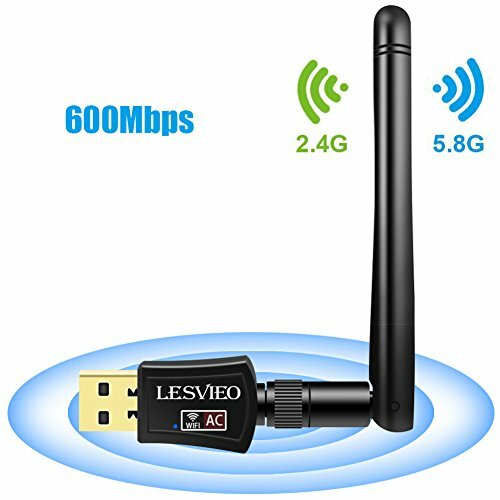 【The Latest Wi-Fi Technology】USB Wireless Network adapter-High Speed Dual Band 802.11AC,Support Dual Band 2.4GHz(150Mbps) and 5GHz(433Mbps). 【High Definition Game Experience】-Performance to reduce freezing and lags when streaming and gaming. 【Exterbal Powerful Antenna】- Stronger penetrate ability, high Gain Long-Range 2dBi Antenna provide better performance for signal connection even signals are weak. 【Stronger Expansibility】: By using this wireless network adapter, you can upgrade your Desktop, Laptop, PC to work with the latest dual band router for faster speed and extended range. If you have any questions about this product by LESVIEO, contact us by completing and submitting the form below. If you are looking for a specif part number, please include it with your message.